I would like to see more of these recipes. Have any more up your sleeve? I make something similar to the "Ghetto McMuffin". I dice a small potato and fry it. 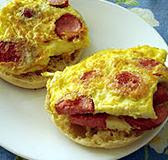 Then I add the eggs and sliced hot dog. We skip the English muffin and cheese. I like it with ketchup.